Rossini Bi-Color Rose has a creamy champagne petal transitioning to darker pink on the edges. 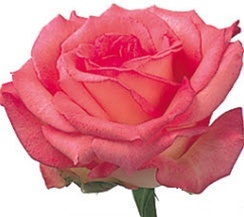 Rossini Bi-Color fresh wholesale roses have large heads, which open fully into a classic-shaped bloom. Rossini Bi-Color Roses are a favorite for wedding bouquets, floral arrangements and lavish centerpieces. We ship fresh from our farms in Colombia and Ecuador at wholesale prices. FedEx shipping is free! Roses from Colombia and Equador have a long vase life when properly cared for. Generally longer stems mean slightly larger rose heads, but not always.